Protein Blend (Organic Pea Protein, Organic Hemp Protein, Organic Chia, Organic Quinoa);Green Food Blend (Organic Wheat Grass, Organic Alfalfa, Organic Barley Grass, Organic Spinach, Organic Spirulina, Organic Chlorella (cracked cell-wall), Organic Broccoli) ;Fruit & Vegetable Blend (Organic Acai, Organic Banana, Organic Beet, Organic Carrot, Organic Goji, Organic Pineapple, Organic Sweet Potato, Organic Raspberry, Organic Rose Hips);Other Ingredients (Organic Peanut Flour, Organic Dutch Cocoa, Natural Flavors, Organic Peanut Flavour, Salt, Xanthan Gum, Organic Stevia). 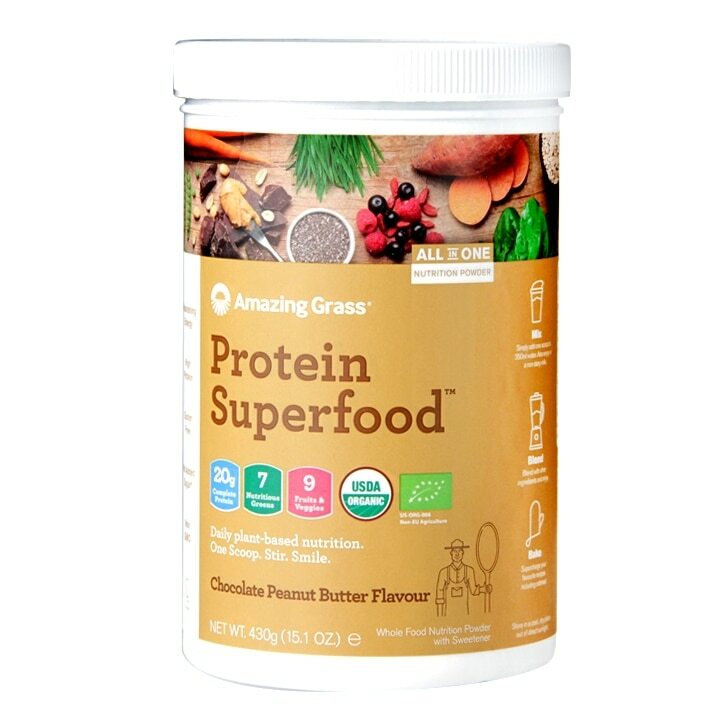 Amazing Grass Protein Superfood Chocolate Peanut Butter is rated 4.9 out of 5 by 17. Rated 5 out of 5 by LadyRobbo from Plant power I bought this a few weeks ago and I have it after a run. The portion is large so I only have half scoop. It’s a bit powdery if just put in a shaker, but when its put in a blender it’s so much better. I also cheekily add half a banana too. Delightful. I’d def recommend this product. Rated 5 out of 5 by Jack2471 from Tastes good. The taste isnot massively chocolatey or peanutty but it's good.